A detail oriented prospect posed an interesting question to me a few days ago, “What is the most undervalued service in the Google Apps for Work Suite?” It’s funny to think that only a couple of years ago I would’ve answered without hesitation, “Google Chrome.” It’s now safe to say however, that cat is out of the bag. While I used to walk into executive conference rooms where some people didn’t know what Chrome OS was, or even use Chrome as a primary web browser, I now walk into conference rooms and consistently see Chromebox for Meetings, or at least have a discussion about how best to leverage Chrome services during the introductory meeting. This time around my answer to the question was “Google Sites.” The prospect seemed surprised, noting that he thought Google Sites was a simplified version of WordPress, while also pointing out that their organization already had a fully functioning website, which they had paid a hefty price for (of course). Ahhhhhh. I casually leaned back in my chair as a Cheshire-esque grin worked it’s way across my face. You, sir are in for a treat, I thought to myself. 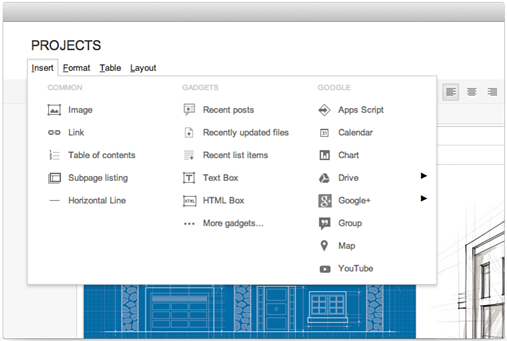 All a user has to do to create a Google Site is select a theme (many are predefined), name the site, and hit create. Once the site is created, a user can immediately start editing content by selecting either the Edit button or the Create Pages button. Aside from the Settings button which will direct the site collaborator to some advanced options, the Edit and Create buttons are the only two options. Hard to get confused at this point! If a user chooses to edit a page, he or she will see standard formatting options, the ability to insert a variety of gadgets, or even adjust the layout of the page with only a few clicks of the mouse. You don’t have to know anything about web design to be a Google Sites expert, however if you want to add some of your own code, there is a convenient “<HTML>” button that allows you to do just that. 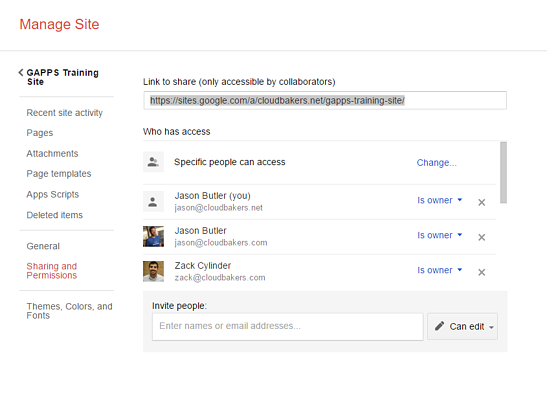 Google Sites allows flexibility in how easy it is to make edits of course, but one of the great things with Sites is how easy it is to delegate sharing permissions. Say you are a project manager, assigning various tasks and subtasks to either individuals or teams; with Google Sites that's no problem! I could make it as simple as saying anyone on the project team has access to this site, or I could make it more granular. I could for example, create a separate page for each project team member, allowing access to that page for only the team member and myself. 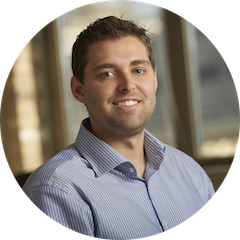 I could have specific tasks, spreadsheets, videos, discussion forums on each individual page, then pool key metrics and graphs onto an overarching project team homepage that everyone has access to. Now I can granularly manage each team member individually, while still keeping tabs on overall project status as a team. Another way to think about flexibility is by thinking scalability. My Google site could have 10 people accessing it or 10,000. Either way I am not concerned with the responsiveness or uptime. I can add or remove access instantaneously and for those that do have access, they can access the site anywhere, from any device, without worrying about the site not displaying correctly. Google Sites really epitomizes what I consider to be the Google Apps philosophy as a whole. You can integrate Apps Script, Calendar, Charts, Drive Files/Folders, Google+ posts and photos, Google Group discussion forums, Hangouts, Maps, and even YouTube by navigating the insert option when editing. Let’s say for example I want to publish a Google Spreadsheet contained in Google Drive to the site. 4 clicks of the mouse and done. I now have a live version of the file for my project team to work on. This ease of integration is the same for working with any of the services listed above. 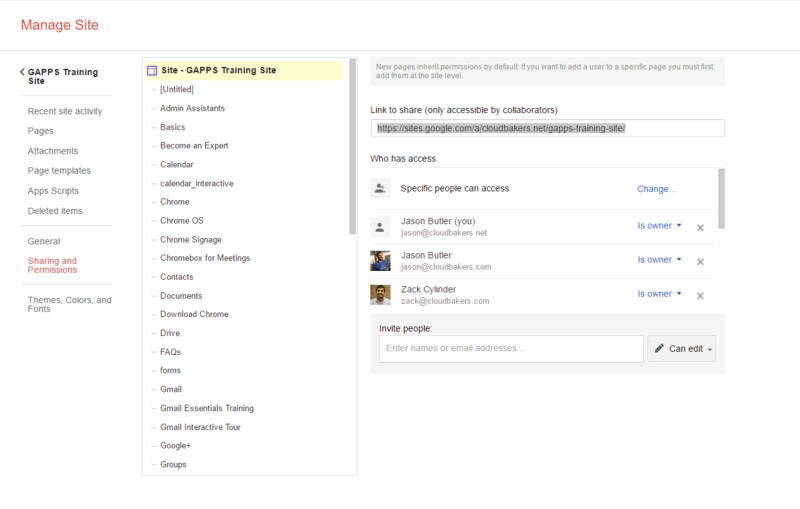 To recap, Google Sites offers a simple, flexible, and easy to integrate platform for users of all proficiencies. Sites can be used for project teams, intranets, and even externally facing websites. You bring the content and Google provides the platform!